Amid difficulties involving the arrest of Huawei CFO Meng Wanzhou, the Chinese telecoms company has drawn attention as netizens wonder how the giant will develop its human resources to maintain normal operations and avoid a brain drain among senior executives. Being a senior executive overseas for Huawei now seems to be a high-risk occupation, following Meng's detention in Canada. The company must avoid a brain drain of its top expertise if it wants to maintain its position as a world leader in 5G technology. 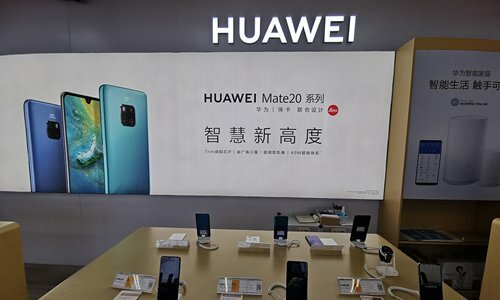 Huawei is facing its toughest test since it became a world-renowned innovative technology company. Whether the company can ride out the crisis depends on what measures are adopted to retain talent and bolster innovation. On Sunday, a post that was circulated online said Huawei founder Ren Zhengfei defined human resources in an internal speech nearly two months before the arrest as involving three kinds of people: those who make up the backbone of the company, those who are heroes and those who are leaders. There is indeed a need for heroes amid the flames of economic war. Retaining talent with a global view is the top priority at the moment. Huawei must step up research and development (R&D) investment both in China and abroad to retain and attract more talent. At the very least, the giant has to further develop its existing R&D centers in overseas markets. As long as the company can retain talent, it can pull through the difficulties. It is a harsh time, and Huawei is sparing no effort to retain talent amid economic uncertainty. That's where Ren's speech came from. Those words spoken by Ren meant the company has fully realized the difficulties it faces in this regard. The company may have to upgrade measures to safeguard personal security as well as the lawful rights of its employees. Compared with the traditional focus on improving team efficiency to create more value for shareholders, generalized security is more noteworthy. We believe Huawei is able to handle this issue properly, and there's little chance that it will experience a brain drain even amid this crisis. Chinese companies are undergoing a boom in outbound investment. Playing a vanguard role in technological innovation, Huawei will probably serve as a reference for latecomers.